So the new version of Soundmuter seems to be done, I’ve tested it and it seems to be stable enough. Whats different from the Pubg muter? The Pubg muter only muted Pubg with a pre-defined keycombo(Alt+N). Soundmuter on the other hand, supports any number of Keybinding to any number of processes. As long as the process actually produces sound, it can be muted. Everything is saved in a .XML file so you don’t have to rebind everything everytime you start the application. First off, download it from the link below. Start the program, find it in your Tray and right-click it. You’ll want to press “Configuration” and make sure the process you want to mute is present. 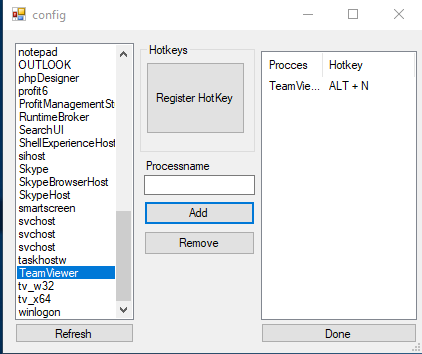 Select it and then press “Register Hotkey” and hold down your keybind you wish to use. Press “Add” and then Done. You can now use the keybind to mute the process. In case the process is not found, for instance you just booted up your computer and dident start Winamp yet, nothing will happen. Picture of the config in Soundmuter. And here the Github for it.